May 2017 - INLINE Commercial Construction Inc.
INLINE recently kicked off another project for Multnomah County. 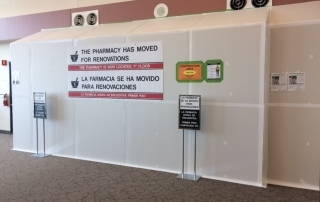 This project is a pharmacy remodel in an occupied space which requires temp wall and barriers. Work will include new cabinetry, floors, paint and electrical work. One of our temp walls is shown below!